Due to the inexpensiveness of it all, travellers in Sri Lanka often stick to the comforts of a hired car or private tour bus, while sometimes venturing onto the infamous trains. 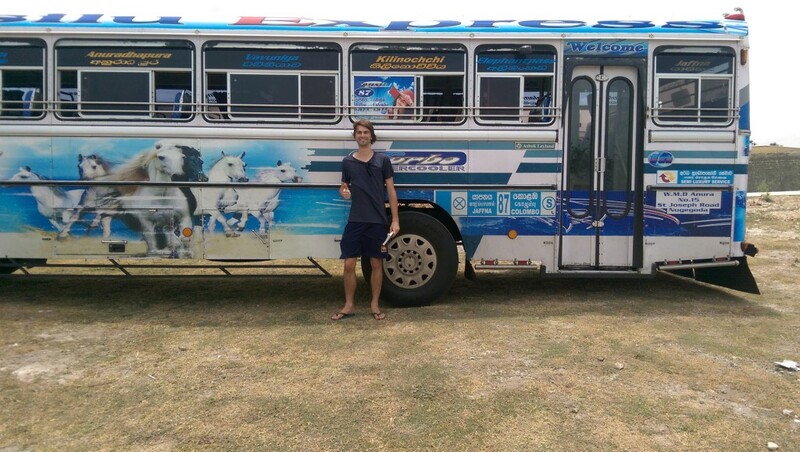 However, if you are backpacking, moving around on a whim and want to get into the action and mix it with the locals, jumping onto a colourful, pollution pumping public bus is almost inevitable. You can get almost anywhere on the island using the ultra-cheap, ultra-crowded bus service. There are short distance, local routes that seem more normal for a public bus, but there are also long hauls of over 10 hours that will really test out your endurance. Major routes have frequent services – just make sure you have some local advice to help you navigate the main bus stations, which can be large, chaotic and confusing. They are ridiculously cheap, never more than a few dollars for even the longest of journeys. The inspectors are incredible, memorising everyone who has already paid and always managing to seek out new comers, no matter where they got onto the jam packed bus. Don’t let the colourful exteriors and decorated interiors fool you – these trips are not for the faint hearted. Each and every bus driver is on a mission – whether it is one of suicide or simply to be home in time for dinner, I’ll never know. But these guys are crazy. They throw those old guzzlers around within an inch of their life; constantly applying the brakes at the very last second with whip lash giving force, screeching around tight corners at terrifying speeds and swerving frantically to avoid oncoming traffic after a daring overtaking manoeuvre. While all this is happening, the situation is made completely comical by the Sri Lankan music blaring through the television (yes – most buses are fitted with a TV, to entertain you with a concert throughout your journey), the style of which I can only describe as a Bollywood/Tropical/Calypso blend. My most terrifying journey was the bus from Kandy to Dambulla. I got on a little while before it’s departure, so I was able to get a spot at the front which had a bit more room for my large backpack. First the driver wrestled the never ending series of hair pin bends which made up the road out of the mountains. This was fine – aside from being thrown constantly from one side to the other, it was more annoying than frightening. Darkness had descended by the time we finally reached a long stretch of straight road. You could almost sense the driver licking his lips. He proceeded to switch off all the lights in the bus and turn the music right up, before absolutely flooring it along this long and very skinny road. There was, of course, only one lane in each direction, but that didn’t stop our man behind the wheel from gobbling up every car after truck after bus after three-wheeler that couldn’t match his foot to the floor skills, by violently veering onto the wrong side of the road. It didn’t matter who was coming in the other direction – it was up to them to slow down, or us to swerve back in time. The only safety precaution taken was the incessant use of the horn. Keep in mind – I had a front row seat in all this, I couldn’t stop myself staring out the front window at the unfolding nightmare. I also remember looking out the side window and thinking “if this bloke drops a tyre off the side here, we’re goners”. I frantically checked my phone for an estimated time of arrival. It was about 25 more minutes that we had to survive. And I counted down every one of them. To say I breathed a sigh of relief when I arrived unharmed in Dambulla would be an understatement. It certainly is an experience, but I hate to imagine how many accidents there must actually be. I met a Jaffna local on the train who told me his story. He was on one of the mini buses, which are the “luxury” option, complete with air conditioning (good luck finding and catching one though – I didn’t). It crashed, the bus rolled and he explained how several people around him were killed. He was on his way to Colombo for scans on his injury. I was mortified upon hearing this, but at the same time, not at all surprised. It’s all smiles until you’re actually on one of those buses! Even after that insane ride early in my trip I still caught numerous buses. The longest was an absurd 8-hour trip from Monaragola to Colombo, which was the main leg in my commute from Arugam Bay. Would not recommend – we had a toilet stop about 2 hours in and then nothing after that. Luckily I had already employed a strategy of drinking hardly any water while on the bus, as this was always a chance of happening. If I was more organised or in a group I definitely would have gone for the more comfortable, direct, night bus or a taxi for that one. I do recommend giving the buses a go – perhaps avoid the long trips. It is one way of inescapably immersing yourself in the culture and you’ll be glad you did it. Just remember to mentally prepare yourself and get ready to hang on for dear life!